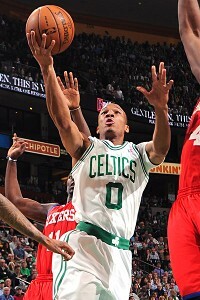 Avery Bradley drives against the 76ers in Game 2.BOSTON -- Celtics shooting guard Avery Bradley aggravated his left shoulder injury midway through the second quarter of Monday's Game 2 loss to the Philadelphia 76ers, but returned to play all but 12 seconds in the fourth quarter. Bradley endured his second dislocation of the postseason when Elton Brand blocked his layup attempt on a drive to the basket with 5:22 to play in the first half. Bradley stumbled to the bench clutching his shoulder and soon departed for the locker room. He sat out the entire third quarter before returning to aid Boston's late-game charge. Bradley dislocated the shoulder in Game 3 of an Eastern Conference quarterfinal series against the Atlanta Hawks and it did not immediately pop back into place. He's worn a protective sleeve over the shoulder in recent games. Bradley finished with 8 points on 3-of-6 shooting with a rebound, assist and steal over 20:14 on Monday. The shoulder didn't appear to detour him in the fourth quarter as he scored 5 points in the final frame and nearly helped Boston overcome a 10-point deficit.